Fifth Harmony group arrived at a 'Hotel Transylvania 2' Special Screening Hosted by Awesomeness TV & Fifth Harmony at Sony Pictures Studios in Culver City, California on September 22, 2015. They all looked stunning dressed head-to-toe in black. Ally Brooke looked as gorgeous as ever in black mini dress that she paired with matching heels. Normani Hamilton rocked black leather mini skirt that she teamed with super stylish leather top and matching pointed-toe pumps. 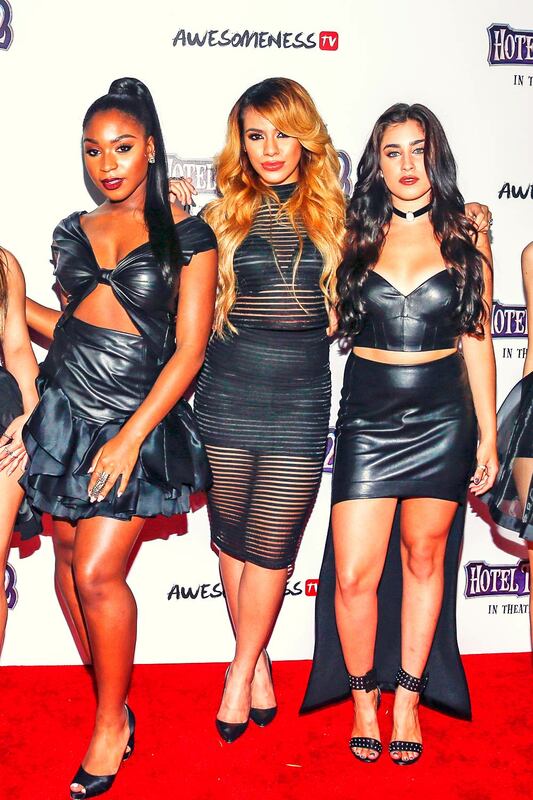 Meanwhile, Dinah‑Jane Hansen decided to wear a see-through dress that she wore over a black bralet and matching skirt. She looked great! Lauren Jauregui also rocked a leather outfit consisting of a stylish skirt and a crop top that she paired with matching studded heels and a smart choker necklace. Meanwhile, Camila Cabello wore a chic mini skirt with matching top and strappy heels. They all looked absolutely gorgeous in their respective ensembles.